Saint Valentine (Italian: San Valentino, Latin: Valentinus), officially Saint Valentine of Rome, was a widely recognized 3rd-century Roman saint, commemorated in Christianity on February 14 and since the High Middle Ages is associated with a tradition of courtly love. Saint Valentine of Rome was a priest and bishop in the Great Roman Empire who ministered to Christians who were persecuted there. He was martyred and buried at a Christian cemetery on the Via Flaminia close to the Ponte Milvio to the north of Rome, on February 14, which has been observed as the Feast of Saint Valentine (Saint Valentine's Day) since 496 AD. The relics of Saint Valentine were kept in the Church and Catacombs of San Valentino in Rome, which "remained an important pilgrim site throughout the Middle Ages until the relics of St. Valentine were transferred to the church of Santa Prassede during the pontificate of Nicholas IV". The flower-crowned skull of Saint Valentine is exhibited in the Basilica of Santa Maria in Cosmedin, Rome; other relics were brought to Whitefriar Street Carmelite Church in Dublin, Ireland, where they remain to this day; this house of worship continues to be a popular place of pilgrimage, especially on Saint Valentine's Day, for those seeking love. For Saint Valentine of Rome, along with Saint Valentine of Terni, "abstracts of the acts of the two saints were in nearly every church and monastery of Europe", according to Professor Jack B. Oruch of the University of Kansas. Saint Valentine of Rome was a priest and bishop in the Great Roman Empire who ministered to Christians who were persecuted there. He was martyred and buried at a Christian cemetery on the Via Flaminia close to the Ponte Milvio to the north of Rome, on February 14, which has been observed as the Feast of Saint Valentine (Saint Valentine's Day) since 496 AD. The relics of Saint Valentine were kept in the Church and Catacombs of San Valentino in Rome, which "remained an important pilgrim site throughout the Middle Ages until the relics of St. Valentine were transferred to the church of Santa Prassede during the pontificate of Nicholas IV". The flower-crowned skull of Saint Valentine is exhibited in the Basilica of Santa Maria in Cosmedin, Rome; other relics were brought to Whitefriar Street Carmelite Church in Dublin, Ireland, where they remain to this day; this house of worship continues to be a popular place of pilgrimage, especially on Saint Valentine's Day, for those seeking love. For Saint Valentine of Rome, along with Saint Valentine of Terni, "abstracts of the acts of the two saints were in nearly every church and monastery of Europe", according to Professor Jack B. Oruch of the University of Kansas. Saint Valentine is commemorated in the Anglican Communion, as well as in the Lutheran Churches, on February 14. In the Eastern Orthodox Church, St. Valentine is recognized on July 6, in which Saint Valentine, the Roman presbyter, is honoured; in addition, the Eastern Orthodox Church observes the feast of Hieromartyr Valentine, Bishop of Interamna, on July 30. In 1969 the Roman Catholic Church removed his name from the General Roman Calendar, leaving his liturgical celebration to local calendars, though use of the pre-1970 liturgical calendar is also authorized under the conditions indicated in the motu proprio Summorum Pontificum of 2007. The Roman Catholic Church continues to recognize him as a saint, listing him as such in the February 14 entry in the Roman Martyrology, and authorizing liturgical veneration of him on February 14 in any place where that day is not devoted to some other obligatory celebration in accordance with the rule that on such a day the Mass may be that of any saint listed in the Martyrology for that day. There are many other legends behind Saint Valentine. One is that in the 3rd century AD it is said that Valentine, who was a priest, defied the order of the emperor Claudius and secretly performed Christian weddings for couples so that the husbands wouldn't have to go to war. The legend claims that soldiers were sparse at this time so this was a big inconvenience to the emperor. 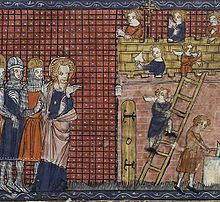 The account mentions that in order "to remind these men of their vows and God’s love, Saint Valentine is said to have cut hearts from parchment", giving them to these soldiers and persecuted Christians, a possible origin of the widespread use of hearts on St. Valentine's Day. A silver reliquary containing a fragment of St. Valentine's skull is found in the parish church of St. Mary's Assumption in Chelmno, Poland. Relics can also be found in the Greek island of Lesbos. ↑ "Scientists reveal what St Valentine really looked like". Mail Online. Retrieved 2018-02-28. 1 2 3 Jones, Terry. "Valentine of Terni". Patron Saints Tom. Archived from the original on April 1, 2010. Retrieved February 14, 2007. 1 2 Cooper, J. C. (2013). Dictionary of Christianity. Routledge. p. 278. ISBN 9781134265534. ↑ Webb, Matilda (2001). The churches and catacombs of early Christian Rome: a comprehensive guide. Sussex Academic Press. p. 254. ISBN 9781902210575. It remained an important pilgrim site throughout the Middle Ages until the relics of St. Valentine were transferred to the church of Santa Prassede (Itinerary 3) during the pontificate of Nicholas IV (1288-92). 1 2 Hecker, Jurgen (February 11, 2010). "Irish priests keep a candle for Saint Valentine". The Daily Telegraph. Archived from the original on February 7, 2018. Retrieved February 6, 2018. A book in the church is filled with countless wishes addressed to the patron saint of lovers, while a steady stream of locals and visitors alike pray here for help in their amorous quests. "God has someone in mind for me, and I obviously haven't met him yet. So I just hope that Saint Valentine will assist me, that I will find him," said one female visitor. Another added: "We just prayed to find the right one, and I believe I will be led to him when the time is right." ↑ Meera, Lester (2011). Sacred Travels. Adams Media. p. When Father John Spratt, an Irish Carmelite returned to his parish in Dublin from preaching in a Jesuit church in Gesu, Italy, he brought the sacred relics of Saint Valentine, given to him by Pope Gregory XVI. ISBN 1440525463. ↑ Chapman, Alison (2013). Patrons and Patron Saints in Early Modern English Literature. Routledge. p. 122. ISBN 9781135132316. ↑ "St. Valentine". pravmir.com. Archived from the original on January 16, 2013. ↑ "XVI kalendas Martii Interamnae Via Flaminia miliario ab Urbe Roma LXIII natale Valentini." In J. B. de Rossi, p. 20 (XVI KL. MAR.). See also M. Schoepflin, p. 40: "the original text". ↑ "CATHOLIC ENCYCLOPEDIA: St. Valentine". newadvent.org. ↑ René Aigrain, Hagiographie: Ses sources, ses méthodes, son histoire, (Paris 1953, pp 268–69; Agostino S. Amore, "S. Valentino di Roma o di Terni? ", Antonianum 41. (1966), pp 260–77. ↑ San Valentino: Biografia. Archived December 29, 2012, at the Wayback Machine. Diocese of Terni. 2009. English version, written probably after examining all previous sources. ↑ Martyrologium Romanum 2001, February 14, p. 141. ↑ "Saints A to Z: V". Catholic Online. ↑ "Latin saints of the Orthodox Patriarchate of Rome". Archived from the original on July 17, 2012. ↑ Martyrologium Romanum (Libreria Editrice Vaticana, 2001. Index, p. 768; Saint Valentina okay finep. 390. ↑ Palacios-Sánchez, Leonardo; Díaz-Galindo, Luisa María; Botero-Meneses, Juan Sebastián (October 2017). "Saint Valentine: Patron of lovers and epilepsy". Repertorio de Medicina y Cirugía. 26 (4): 253–255. doi:10.1016/j.reper.2017.08.004. Valentine placed his hands over her eyes, prayed to God, and Julia was able to see. Asterius, in awe of Valentine's power, converted to Christianity, along with 46 members of his family. He then also freed all Christians who were confined in his prison. ↑ Castleden, Rodney, "The Book of Saints". 2006, p.28. ↑ "St. Valentine". Catholic Online. 1 2 Kithcart, David (25 September 2013). "St. Valentine, the Real Story". CBN. 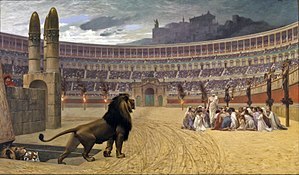 In the year 269 AD, Valentine was sentenced to a three-part execution of a beating, stoning, and finally decapitation all because of his stand for Christian marriage. The story goes that the last words he wrote were in a note to Asterius' daughter. He inspired today's romantic missives by signing it, "from your Valentine." ↑ Under the circumstances, Emperor Claudius was a detail meant to enhance verisimilitude. Attempts to identify him with the only 3rd-century Claudius, Claudius Gothicus, who spent his brief reign (268–270) away from Rome winning his cognomen, are illusions in pursuit of a literary phantom: "No evidence outside several late saints' legends suggests that Claudius II reversed the policy of toleration established by the policy of his predecessor Gallienus", Jack Oruch states, in "St. Valentine, Chaucer, and Spring in February", Speculum 56.3 (July 1981), p 536, referencing William H. C. Frend, Martyrdom and Persecution in the Early Church (New York, 1967, p 326. ↑ Jack Oruch, "St. Valentine, Chaucer, and Spring in February", Speculum 56.3 (July 1981 pp 534–565) p 535. ↑ Christensen, Max L. (1997). Heroes and Saints: More Stories of People Who Made a Difference. Westminster John Knox Press. ISBN 9780664257026. ↑ Frank Staff, The Valentine & Its Origins, 1969, Frederick A. Praeger. ↑ Henry Ansgar Kelly, in Chaucer and the Cult of Saint Valentine. 1986, p. 62, says: As Thurston has noted, no English church is known to have been dedicated to St. Valentine (Thurston, Butler's Lives, 2:217). I should add that we have no record of a large number of churches in England. ↑ Christian Hülsen, Chiese di Roma nel Medio Evo (Florence: Olschki, (On-line text). ↑ Butler, Alban (1981). Butler's Lives of the saints. Burns & Oates. ISBN 9780860121121. ↑ Chanchreek, K. L.; Jain, M. K. (2007). Encyclopaedia of Great Festivals. Shree Publishers & Distributors. ISBN 9788183291910. ↑ See February calendar listed here on the Church of England website. ↑ Glav. "Greek name days of the year 2015 – month of celebration : February". Εορτολόγιο Ελληνικών Ονομάτων – Orthodox Greek Namedays. ↑ Henry Ansgar Kelly (1986). Chaucer and the Cult of Saint Valentine. BRILL. pp. 58–63. ISBN 90-04-07849-5. ↑ Michael Matthew Kaylor (2006). Secreted Desires: The Major Uranians: Hopkins, Pater and Wilde (electronic ed.). Masaryk University Press. p. footnote 2 in page 235. ISBN 80-210-4126-9. ↑ Jack Oruch identified the inception of this possible connection in Butler's Lives of the... Saints, 1756, and Douce's Illustrations of Shakespeare, and of Ancient Manner, see Oruch, Jack B. (July 1981). "St. Valentine, Chaucer, and Spring in February". Speculum. 56 (3): 534. doi:10.2307/2847741. ↑ Oruch, Jack B. (July 1981). "St. Valentine, Chaucer, and Spring in February". Speculum. 56 (3): 534–565. doi:10.2307/2847741. ↑ BN, Mss fr. 185. The book of Lives of the Saints, with illuminations by Richard de Montbaston and collaborators, was among the manuscripts that Cardinal Richelieu bequeathed to the King of France. ↑ "Love-seekers show up at St. Valentine's resting place in Dublin". IrishCentral. February 10, 2017. Archived from the original on February 14, 2017. Retrieved February 14, 2017. ↑ "Radio Praha – Ostatky sv.Valentýna jsou uloženy na pražském Vyšehradě". radio.cz. ↑ "Chełmno – miasto zabytków i zakochanych". chelmno.pl. Archived from the original on January 23, 2015. ↑ "Skull bits of St. Valentine in Chelmno". Atlas Obscura. ↑ "The Holy Relics of St. Valentine Lie on Lesbos Island". Greek Reporter.